Our calling in our ward is to be Sunday School teachers for the fourteen and fifteen year-olds. It's super nice that we joint-teach as a couple because if everyone on our two (yes, two) roles attended class every Sunday, we'd have twenty-six students. YIKES. Most Sunday's we have around seventeen, which is a much easier number than twenty-six, so we'll be grateful on that front! Although, I guess I shouldn't be happy that a bunch of our students are never at church. Well, you know. Gotta find happiness in the little things, right? We've been teaching our class for over a year now. Throughout our teaching, we've done a lot of drawing on the white board and now blackboard because our classroom got switched when our church time was changed at the beginning of the year. So, sometimes I do the drawing on the board. Sometimes Bradley does. And we get made fun of by our little (or large) students all the time as we're hurriedly scribbling beards onto Book of Mormon stick figures and drawing some robes on because the kids ask why they're naked. But guess who gets made fun of the most? Well, apparently my arteest-ness hasn't completely left me, because the kids are less likely to make fun of me. However, Bradley gets teased or asked, "What's that supposed to be?" more often than not. 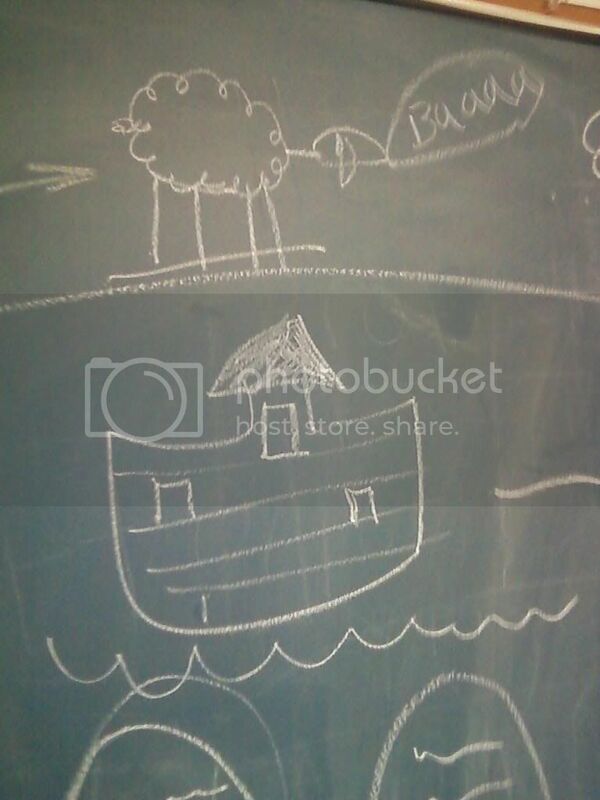 So, this past Sunday we found ourselves again drawing out stories from the Bible and the Book of Mormon on the board. This time it was Bradley drawing, and to the pride of everyone there, he did some great artistry up on that ol' black slate. I mean, check out that sheep! Mine always get made fun of by our students; they usually come out looking like fat clouds with eyeballs. (Sheep is apparently a commonly drawn thing in church.) And his ark totally looks like an ark. But really, the crowning achievement was the sheep. I was so proud that I had to take a picture. Got to keep it for posterity's sake, right? But seriously. So proud.